Love beautiful sunrises and cocktails outside in the evening? Enjoy them both from the oversized lanai with water view. 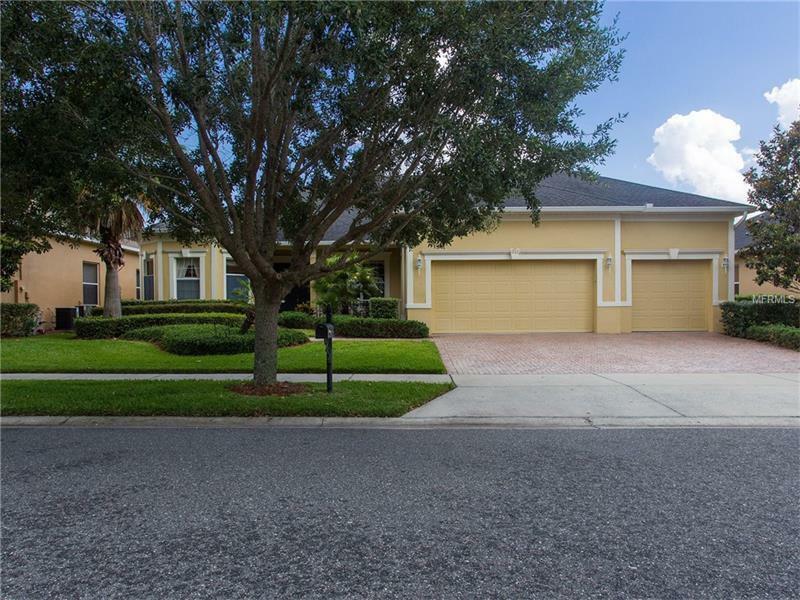 This 3 bedroom, 2 1/2 bath, 3 car garage is what you're looking for. No sounds of traffic here, just the sounds of birds and occasional sandhill crane. With an open floor plan, this home is made for entertaining. Extend your entertainment area by opening the stacking slider to the lanai.This split plan features a beautiful master bedroom suite with two walk-in closets, two vanities, shower, garden tub, and make-up area. The guest wing has two bedrooms, a bath, and generous-sized den. You'll love cooking in the kitchen with 42" cabinets, granite counter tops and an oversized pantry. Enjoy reading the morning paper in the breakfast nook with a beautiful view of the pond. Windows on the back of the house are tinted to reduce glare within house. Flooring is a mix of diagonal tile, wood laminate, and carpet. Carefree living with two new (2015) HVAC units and new hot water heater(2015.) So what are you waiting for?